If a tool is to be judged on it's utility then this is a winner. What makes this base so great is that it does what it's supposed to do, does it well, and sells for around fifty bucks. My shop is so small Hennie Youngman could do a whole routine around it. I don't have the luxury of thousands of square feet of space to plant work stations and production tools. So, I rely on putting everything on wheels to keep it out of the way untill I need it. I made my own untill I discovered the HTC2000 mobile base. I ordered one for my jointer and another for my table saw. 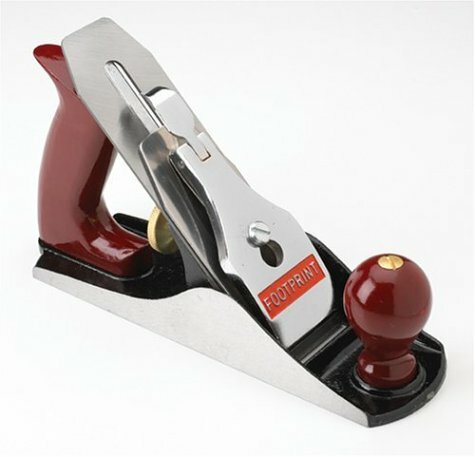 My jointer is now a dream come true! The large wheels track easily and smoothly and it sets down firmly. The only drawback was that the front was higher than the back but that is an easy fix with a spacer or adjusting up your machines leveling feet. Oddly enough I did not have this problem on the second one I ordered for the table saw. That on is so level you could set grade with it. For the life of me I can't figure the difference but who cares? The only downside I noticed on the one for the table saw was that my saw may be a little heavy for it. I have an old, big Craftsman with a custom made T-Square fence. It rolls very nicely but the cam levers for raising and lowering seem to strain a little in the lift mode. If you are going to move larger machinery I would suggest contacting the company regarding their custom made program. Overall, if you ever want a stationary machine to have any portability you can't go wrong with this product. And at this price, you can afford a little custom tuning to get exactly what you want. This is the third mobile base that I have purchased and it is the first one from HTC. My other two units are the Delta mobile base in which you must provide the hardwood cross members into their provided corners. These two units support my Jet Contractors saw and my Jet 14" CS Band Saw. The HTC unit is for my Jet 6" CS Jointer. Overall the unit assembled easily and holds the Jointer very well. My biggest complaint with the unit is that it does not provide the movement flexibility that my other units do. I have a small workshop and need to swing the units around easily. 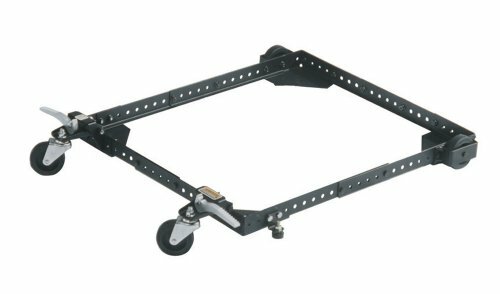 The Delta base has a single wheel centered on one side of the frame and it can pivot very easily. The HTC unit with its two pivot wheel design does not permit easy movement. As I continue to expand my workshop I would not purchase this style again with the two wheels. So, who has the free wall space in either workshop or garage to just leave a bandsaw, drill press, table saw, or router table in one place without banging the materials from your project into a nearby cabinet or storage shelf? I sure didn't. 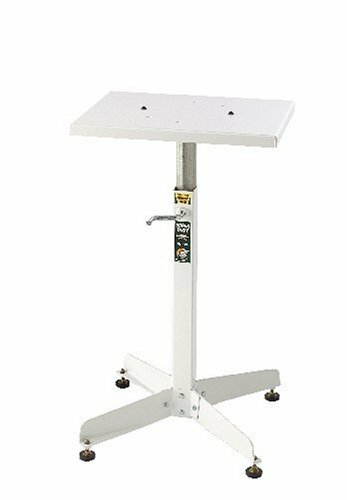 Believe me, dragging the drill press or band saw into the middle of the garage was never as much fun as it seemed ;-) Sears has a mobile base exactly like this one, but for $20 more. I bought three, and they arrived super fast in great shape. All parts accounted for(! ), and easy to assemble. I'd recommend attaching the base to the tool with some bolts, though (not included). 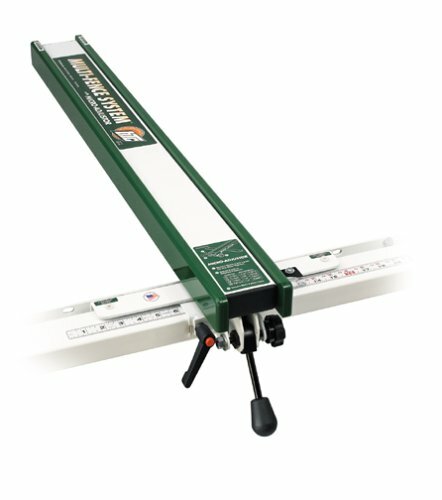 Leveling is easy to do, the base is quite stable, and the rolling action is very smooth. I thought it would be hard to justify the cost, but after buying and mounting them, I wouldn't go back. 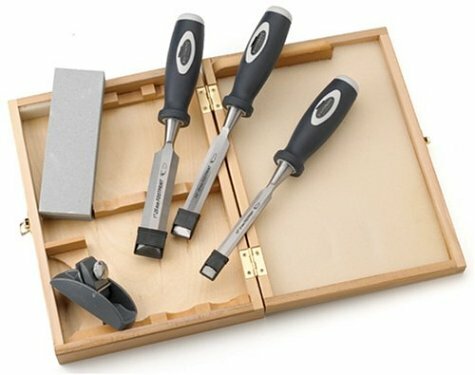 Excellent product...a definite necessity for large shop tools. July 13, 2004 I bought a HTC2000 at $43.00 from Amazon.com. July 17, 2004 (3 days later) Amazon.com increased the price by (28.3%) ($16.99) to $59.99 each. Ouch! The price increase of steel did not jump that high. Now I believe I'm in the minority based on these reviews I see. Let me tell you my experience and use your own judgement, it's fine to have a differing opinion. I used this for my Jet contractor saw, not that time consuming to put together but more so than the one piece unit I replaced it with. Trying to lock it steady on those rubber feet took more time to do than putting it together. Then, If I move the saw to use my router table I have to readajust it since my cement floor only looks completely smooth. so there's some back and forth issue with making the thing stable when it's moved and repositioned. I'm not talking about cobblestone imperfection, it's subdle variations in concrete that make 4 wheels rock back and forth ever so slightly if they're not just right. Those 2 rubber feet have to take the weight of the saw and hold it steady or else if you push something heavy there's a chance the saw will move during your pushing. I don't want to have to follow my saw back and forth with shim stock. The nut and bolt type adjustment is tedious. I think Shop Fox has a heavier universal base that uses 2 feet but with large knob adjusters and also a thicker frame. 3 wheels always stay on the ground regardless of the slight imperfection which is what I've found on the one piece mobile base that's made specifically for individual equipment. I just put the one piece base on and forget it. Rolling circles to my hearts content around like a crazy merry-go-round. Stop and cut or route and back to where it once was, no problem. Cost twice as much, saved more than that cursing this univeral base. I installed the HTC outfeed rollers on my Powermatic 66 Tablesaw this afternoon. Everything went together as explained in the instruction manual and all the parts were there. This addition will make ripping larger panels alot easier. I have had some bad experiences with HTC products in the past, but I am very pleased with this product. Assembly and adjustment was simple and took about 1 hour. The Roller system is a excellent piece of equipment! It took a while to adjust the height of the rollers to the table. When I did, all rollers were flat with the table. The only downfall of this product is customer service! I had a defective part when assembling. Called 5 weeks ago and still have not recieved a replacement for the defective part! The design and flexability of this outfeed roller table is great. The only complaint I have is that (as others have written) the roller plane tolerance is not very accurate. 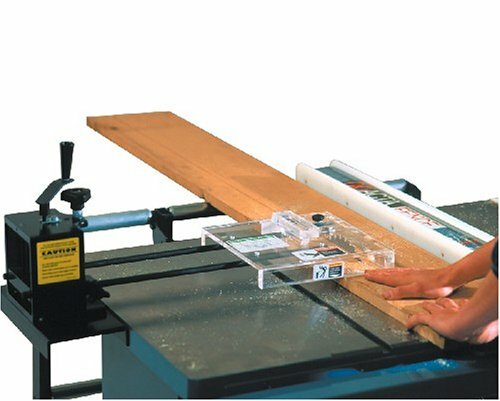 Some rollers are as much as 1/8" lower or higher than the leading and last roller. I would think HTC could do better at aligning the rollers or make the alignment adjustable. I ended up attaching a removable laminated table top to the frame insted of using the rollers. Maybe HTC could sell just the folding frame without the rollers at a discounted cost. It was still worth it to me just to get the folding frame. The table folds and unfolds easily. Attachment to my saw(Powermatic 66) was easy, I installed it myself in 2-3 hours. Its great to have the outfeed table/rollers permanately attached to the saw and always in alignment when folded into place. Since I have limited space and all my equipment is mobile, its nice to just be able to fold the outfeed table down and out of the way. It is a better and more convenient design than any other outfeed table that I've seen. It took a little extra work to add a seperate tabletop, but I am glad I got one. I am the owner of a small one man shop. I have limited space so many of my larger tools are on mobile bases. I wanted the outfeed rollers to support 4X8 3/4" plywood and mdf that I use to make cabinets. The instructions/diagrams in the installation instructions were straight foward. Although, if you are putting the roller on a unisaw you have to move the on/off box - but instructions are in the installation manual. I put the rollers on a grizzly table saw. You will want to remove the table top to get to the inside of the saw. I took advantage of when the table top was off and did machine maintence(i.e. adjust belt tension, clean and lubricate.) You will be drilling eight holes in the back of the cabinet. A template is supplied for the top four holes. The bottom holes are drilled with the support bracket mounted. I installed the roller myself in about three hours(including the machine maintence), but it would be easier to install with a helper. You have to tap the mounting bracket around a bit to find level. The adjustment screw on the bottom of the support arm is a hassel to get to once installed. I cut off an open-ended wrench to 4" in length to get to it for adjustment(rated 4 rather than 5 for this reason). Other than that it is working great and I am very happy with it. The only other advice that I would have is that if you don't like playing with stuff a little to get it to work well you may not be happy with the rollers. I recently purchased this mobile base and I must say that for the price it can't be beat. The base is well built, easy to put together and performs as advertised. I was ready to buy craftsmans version ...untill I found this one. From what I've seen they appear to be the same except for the price. 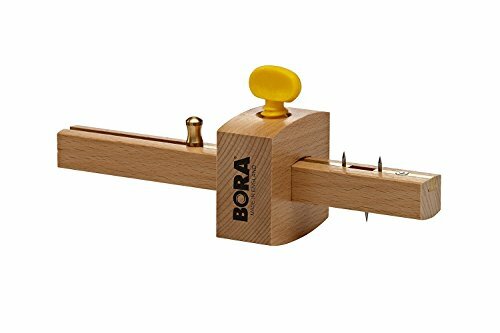 I highly recommend one for all non portable tools in your workshop. This universal mobile base is a real piece of work. It goes together easily and is a simple but functional design. Since it is a "universal" base, holes must be drilled to make it fit most equipment. I mounted a Ridgid band saw on this base and I chose to drill new holes where the legs were bolted to the base. This required only 4 new holes. To adjust the side rails would have required more holes. The only down side to this base is that user must have access to a drill press for the holes. The metal used is substantial. I intend to purchase 2 more to use on a drill press and table saw. I figured I'd have to drill a few holes to make it fit my craftsman table saw. I wasn't disappointed. If the unit you're going to put it on will need to be bolted to the base (and they all do), expect to drill holes in your unit, the corners of the base, or in the support beams. I decided to drill the support arms, and I only needed to do that in two of them. The other dimension worked out to be exactly the right length. Once I'd drilled the holes, the whole thing went together just fine. The saw moves around effortlessly and the whole unit is a LOT more stable now. I'm quite satisfied. Four stars because I had to drill it. But then, I don't believe there's a mobile base made that doesn't require some mods. Price was right, and it works like a charm. First, to be positive, I agree with the other reviews that the finished product is a nice mobile base. 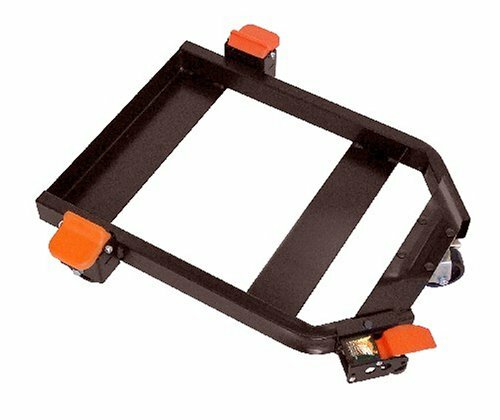 I ordered mine for my Jet 12" bandsaw and it is a good fit and plenty strong. My issue is with the assembly experience. As others say in their reviews the assembly instructions leave something to be desired. I just don't see why companies don't take an hour and build one of their own products up while reading their own instructions. The problem is they know too much and assume things that aren't written. A minor annoyance was that the numbers of nuts, bolts, washers, etc. didn't match with the quantities listed in the parts list. In the end I had enough of everything but I'd like to have at least what is listed. But my BIG gripe is the fit of the side metal brackets into the corner brackets. Maybe I got unlucky and got some brackets that were out of tolerance but with the side brackets tight against the corner brackets the holes still didn't line up. I ended up having to drill some of the holes a bit larger to get the bolts through. A good finished product and the price is right but not a particularly happy assembly experience. This one is a loser. Not the best way to move a saw. I recently purchased this base to move my new Jet cabinet saw in and out of my small work shop and onto the deck in front. There is a small drop (1/2") from one floor to the other. This method of base construction will not allow the saw to make this type of transition. For me that was a big negative. The base is of no use. Also, the base arrived with one of the two taped holes for the wheel locks left blank. Any minimal quality check would have spotted this. When I called HTC they said to tap the hole myself. For what I paid for this base I could have made my own much better. The only good thing I can say is it's sturdy and the finish is good. I guess I'll try to sell it. Look carefully before buyung this base. I purchased the mobile base with Jet table saw and also found that when the saw was initially placed on the base (before adding the fence rails and extension table) the base bowed toward the floor in the middle; in fact the bottom of the saw was a good half inch lower toward the center of the base than toward the outside of it. The base ulitmately relies on the rigidity of the fence rails and extension table in order to keep it straight/level. I also found that this made it difficult to line up the extension table with the cast iron top during assembly. 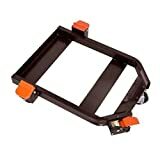 As another reviewer noted, the base would also be more useful if it had some sort of jack screws to allow it to be leveled when not in rolling mode. I purchased two heavy duty toggle clamps and mounted them to the base so that they push against the floor when the base is parked. For the price of this base, I would have expected more. The design of the Delta mobile base seems to be more solid; it has two rails between the saw and the end of the extension table rather than one (more strength and less bowing), and it does have leveling screws incorporated into its design. If I could easily lift the saw and place it on a Delta base, I would be tempted to do so. I bought my base with my new 36-960L Unisaw because I knew I'd need to be able to position it and reposition it alone. I am pleased with it, and it rolls the big HEAVY saw around fine. My bone is when I have the saw positioned, I wish it had jacking screws to anchor it and plumb it. So I'm making some corner "Shoes" with jacking bolts for that very use. My garage floor has a slight slant to it for drainage reasons and I have resorted to wedging the HTC base to plumb it up level. Otherwise, I think it's a fine base and made moving the big saw in/out/and around very easy. 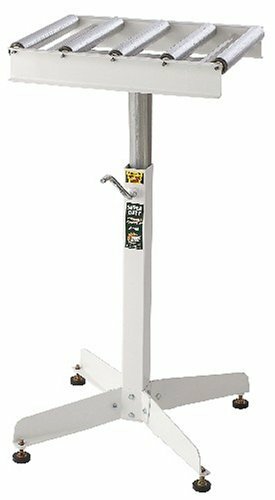 Heavy duty easy to use, micro-adjust enables you to atach fence accessories and shop built fixtures & jigs. Bolts don't fit holes -- bad omen? be levered up onto their wheels when you need to move it. Not Big enough for Table Saws as pictured but it covers every thing else..... Jig saws Belt sander's my 18 1/2 Planer etc. Magnet's keep cover in place while I blow down my shop and cover keeps most dust, dirt and dampness of my machine tops......... worth EVERY Penny! Buy several! Keeps the dust and rust away, what can a man say? I haven't had them long enough to see if they really prevent rust, but I like the weight and breathability. I agree with another reviewer that the magnets are virtually useless. I wish there was an additonal size of 56" x 56" for bench planers and such. I haven't found anything that the 36" x 56" fits. Hopefully these covers (I've bought a medium and two large) will do the job intended. That is to keep the equipment free of dust and dirt without trapping moisture on the unit whereby rust would form easily. The material is quite light weight (for the cost of these you might expect something heavier) which may tear easily if caught on the machine when you're pulling it off. However, the biggest shortcoming of these covers is the inadequate magnet strips stitched along 3-4 inches of the seam in each corner. These magnets are all but worthless. They are so weak as to not hold the corners of the (light weight) cover up underneath the top of a table saw or jointer. At best, they may hold the cover corners to vertical edges only. At that, a slight breeze will send the cover flapping. My solution is to get rare earth magnets that have a hole in the center and stitch or rivet them on to the corners of the covers. I'm sure these will do the job of holding the cover corners to the equipment. Something the HTC factory stitched-on magnets don't do. 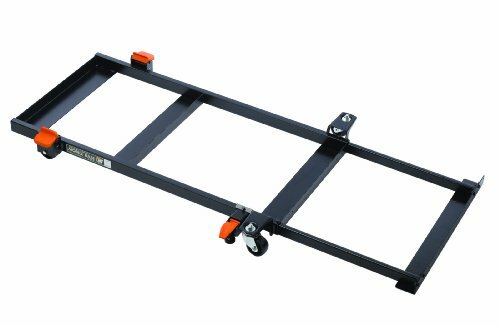 I bought the Jet JWTS-10CW2-PFX contractor table saw with the 52-inch fence and followed the link to this page and purchased the base also. The good news are that the base is easy to assemble, makes moving the table saw a breeze and even looks better than the picture above. The table saw sits on a rectangular frame and the legs of the extension table sit on an L-shaped bracket attached to that frame by a Y-shaped structure. The bad news is that the HJTS-761G base was built for a 50" extension fence. If you are getting the 52" version, before installing the legs you need to remove the end hardwood board on the extension table and re-install it 1 3/8" from the end. That way the legs will be in the perfect position. After that little tweak, the mobile base is definetly worth the money I paid for it. 12. 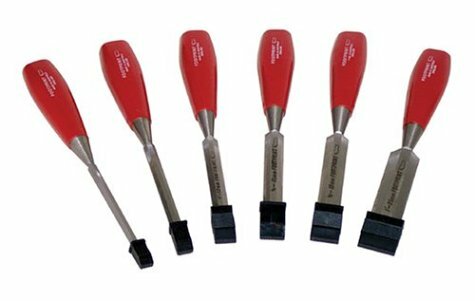 Footprint 85 Series 123120 Set of 6 Red Acetate Handle Wood Chisels 1/4", 3/8", 1/2", 5/8", 3/4", 1"
Fits machine size of 23.5"x 27.75"
Fits machine size of 17.25"x20"